MD Pack Industries Sdn Bhd is a dynamic and forward thinking company which offering one-stop, total packaging concept solution for our customers. MD Pack Industries established in 2007, our growth has been cautiously planned but aggressively executed. Our main office is located in Ipoh, Perak, Malaysia. We specialize in paper pallet, paper packaging, printing & packaging, digital pre-press, media duplication, kitting & distribution, triple wall, slip sheet, corrugated carton, paper pallet, paper board, single facer, corrugated & honeycomb box and heavy duty carton box. The company believes that each and every customer is special. In line with this philosophy, MD Pack Industries Sdn Bhd ensures that designs and packaging solutions are based on specific needs and feedback of the customers. Every customer is guaranteed to receive the best quality product with its own individual design. 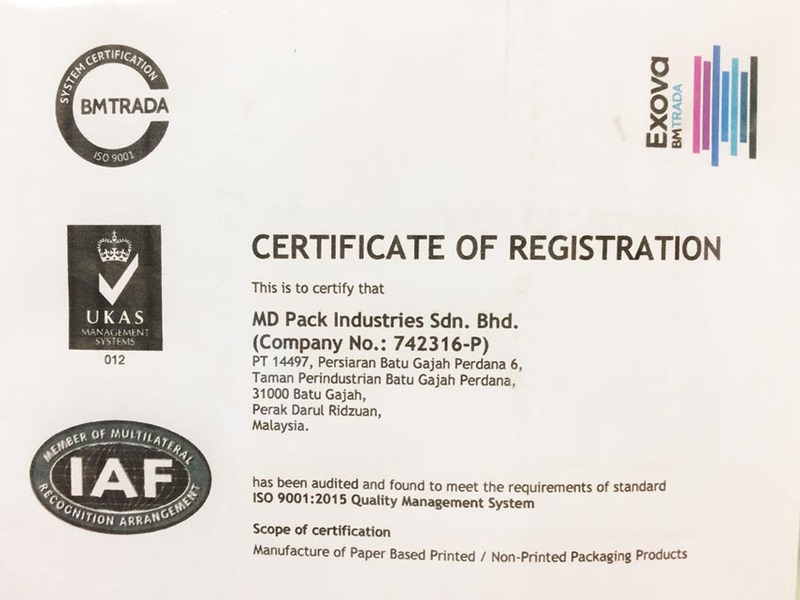 Although already ISO 9001/2015 certified, MD Pack Industries Sdn Bhd never rests on its laurels, but instead strives even harder to play its part as global player customized packaging. Understanding the dynamic nature of the business market, the company strives for maximum exibility whiles consistently maintaining the highest quality of its products. MD Pack has acquired a wide range of machinery with the single minded aim of producing the highest quality products. New machinery is also constantly acquired in order to enhance production capability and capacity, with a sizeable portion of the company's annual budget allocated for this purpose. Our Total Packaging Solutions provide customers with an ease of mind over managing their packaging requirements. Our turnkey solutions include graphic and structural design, printing and packaging, digital pre-press, media duplication, kitting and distribution. Our company has well developed individual teams focusing on professional packaging solution with high creativities, lean and timely production and deliveries. With the facilities and these services, we are able to provide customers with the support to effectively manage their quality and timing requirements. Our talented in-house designers coupled with cutting-edge technologies, enable us to successfully work with our clients in developing efficient & innovative packaging and creative display designs. Our design team is involved from the conceptual stage to completion, by developing prototypes and mock-ups, finally to production.